The team at Kentucky Fried Chicken has released a series of buzzworthy deals over the past few months, ranging from a free 2 piece meal coupon to the grilled chicken campaign covered on unthinkfc and by Oprah. 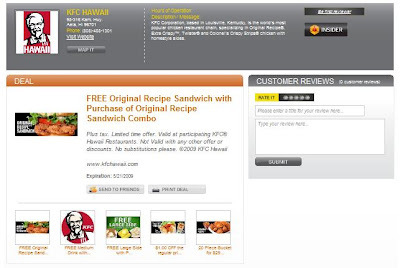 What's not to love about free food and drink deals - especially coming from a restaurant chain as popular and ubiquitous KFC Hawaii? The KFC staff throughout Hawaii is ready to serve. Check out the deal and let us know how your meal went, we'd love to hear! Share these amazing offers from KFC with your friends, family, and coworkers.